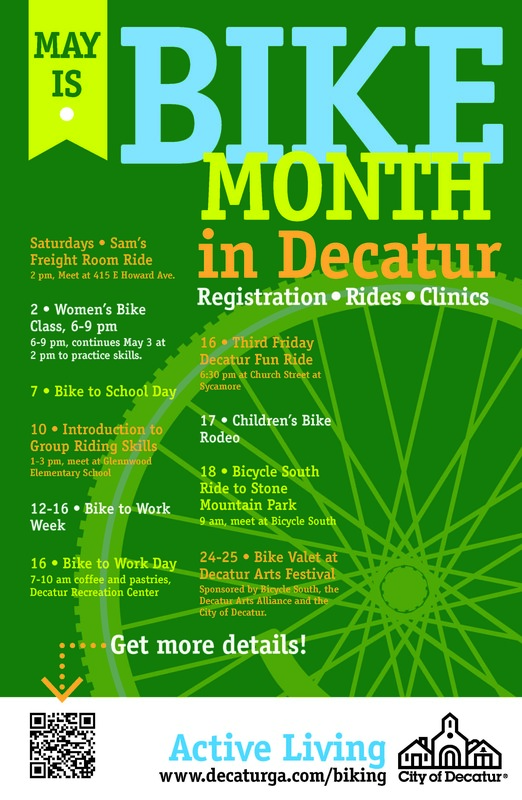 The City of Decatur is participating in National Bike Month with a plethora of activities. Good time to dust off the bike and hop on for a ride! On May 7, it’s Bike to School Day and a good time to review Bike Safety in the classroom with these FHA free videos for youth/teens. Stop by our energizer station in front of the Recreation Center this Friday @7am. Take our 8-question bike commuter survey now or while you are there. In addition to the activities listed on the poster, join Decatur Bikes on Saturday mornings for the Decatur Bikes Saturday Morning Breathe Easy Ride. This Ride goes from March 29th until the temp drops below 50 degrees, usually near the end of October. They gather in the CVS parking lot at 7:45am for an 8:00 am leave time. This is a NO DROP RIDE so all skill levels and all types of bikes are welcome. They usually go out to Stone Mountain Park, take a lap around and head back to Decatur. The ride is 98% on the bike path. Average speed is usually around 12 miles an hour and you WILL NOT BE LEFT BEHIND!!! It ends up being around 25-30 miles of fairly easy riding. We like to say the ride is at a conversational pace. Helmets are required. If rain is expected then we probably won’t go but call 404-941-8717 to make sure. For more information about any of the events, contact cheryl.burnette@decaturga.com.